For the first category, the choice of where to live will be determined by the place of work. The large majority will be residing in Metro Manila, often in one of the more expat-friendly areas like Makati City or Bonifacio Global City (which is part of the City of Taguig). The term “expat-friendly” is not used here to describe the attitude of the locals –- because Filipinos are mostly friendly to expats wherever they are –- but to refer to the availability of food, beverage, and service outlets that would be considered to be on a par with international standards. When choosing where to live in within the boundaries of Makati or BGC, it is essential to look at transport options to the place of work, because in the rush hours, it can take an hour or more just to travel from one side of Makati to the other. Some expats prefer to live outside of the city because of the air pollution in Metro Manila (an important consideration for those who suffer from asthma or who have had other respiratory problems in the past), but this can increase commuting time very considerably. For expatriates moving to Manila with their families, and who may prefer a house and garden to a condominium, some of the gated communities south of the city might be an option, if they have easy access to the Skyway or South Luzon Expressway (SLEX). For expats in the other two categories, there are many options aside from Metro Manila. For those whose spouses have relatives in the Philippines, the choice of where to live is often determined by where the relatives are living, but for others the first choice is often the Philippine’s second city – Cebu. Cebu has most of the facilities offered by Metro Manila, without the same level of urban congestion and air pollution (although parts of central Cebu are getting close to being on par with Manila). The big advantage that Cebu has over Manila is that it is easier to get out of the city, and there are more rural locations within commuting distance of Cebu. The city is also the transportation hub for the many tourist destinations in the central Philippines (a region known as the Visayas), which means there are many opportunities for weekend getaways close by. The Mactan-Cebu International Airport is the second busiest in the Philippines and has direct flights to 14 cities in Asia including Singapore, Kuala Lumpur, Hong Kong, Seoul, and Tokyo. This means expats living in Cebu can travel in and out of the country without the unpleasant experience of transiting through Manila. There are many expats living in smaller towns on the islands of Cebu and Mactan, or nearby Bohol, as these areas are considered relatively safe for foreigners compared to other provincial areas of the Philippines. Located at about 5,000 ft above sea level in the mountains of Benguet province about five hours drive north of Manila, Baguio offers a cooler climate than the rest of the country, which is why it attracts a small number of expat residents. Known as the Summer Capital of the Philippines, Baguio was the very first hill station established in Asia by the United States in 1900. Its maximum temperatures vary from 23-26 degrees Centigrade throughout the year, compared to the equivalent lowland figures of 30-34 degrees. In the coolest months, nighttime temperatures can go as low as 12 degrees in Baguio. Although Baguio does have a large shopping mall and some very good restaurants, it doesn’t offer the same level of facilities such as healthcare and international schools as other Philippine cities, which is why it hasn’t attracted a larger number of expats despite the comfortable climate. This unattractive city about two hours north of Manila attracts a lot of single male expats because of the presence of many go-go bars and nightclubs. It is served by its own international airport at nearby Clark (an ex-U.S. air base), which enables many travelers to bypass Manila. Subic Bay, another hour further on from Angeles City, is an ex U.S. naval base. This is a popular beach destination with single male expats due to the presence of go-go bars, but on a much smaller scale than Angeles City. Although there are quite a large number of expatriates living in and around Davao – the largest city in Mindanao and the Philippines third largest metropolitan area – most countries publish travel advisories advising against traveling to Mindanao, which is under martial law due to the activities of extremist groups aligned to the Islamic State. Despite the travel advisories, for many years expatriates felt it was safe to live in the eastern half of Mindanao – away from the regions where the extremists were most active – but in recent years the bombing of a market in Davao City and the kidnapping of expatriates from a resort near Davao (who were later beheaded) have changed security perceptions. 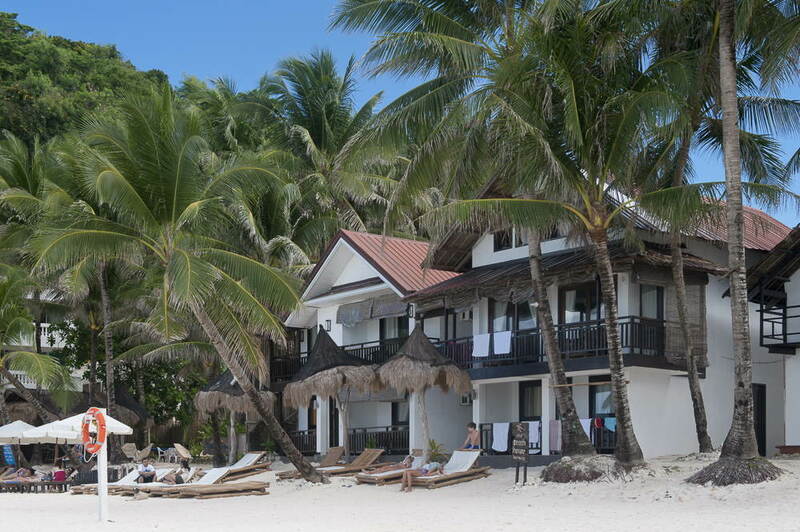 Buying and managing a tropical beach resort in one of the many idyllic tourist destinations dotted around the Philippine islands is the dream of many expatriates who have visited the Philippines. But it’s a dream that can only be realized by those with a Filipino spouse (or a Filipino partner they can trust) because of restrictions on foreigners owning businesses in the Philippines. However many have done this by putting the business in their spouse’s or partner’s name and are living the dream in exotic locations such as Boracay, Puerto Galera, El Nido, or Coron. Others are doing it in lesser-known tourist spots all over the country. For other expats, especially retirees, the dream might be a small farm or a rural property in one of the provincial regions of the Philippines. Again there are many expats already doing this, but for non-Filipinos the only option is to lease, because non-Filipinos cannot buy land. For those seeking a rural lifestyle, it’s important to get local advice on security issues before committing to a lease, because there are separatist groups such as the New People’s Army (NPA) that are active in some provinces. Petty crime is also a problem due to rural poverty and high unemployment. Most gated communities and residential farm estates in provincial areas have armed security guards for this reason. The provinces of Laguna and Cavite are popular with expats because they are considered relatively safe and are close to Metro Manila. There are many new gated communities in these two provinces offering home rentals to suit all budgets, as well as rural properties. Most parts of Laguna and Cavite are no more than 1-2 hours away from Metro Manila, which means that access to world-class medical facilities is almost as good as living in the city. The freeways from these provinces provide easy access to the international airport, which is on the southern side of the metropolitan area. Whatever the location ultimately chosen –- whether it be urban, beach, or rural –- expats should always keep a low profile in the Philippines and never get involved in local politics. Make friends with the neighbors and become an active member of the local community – which of course is good advice for any expat wherever they are living.